When I first laid eyes on this Glamorous dress, it was love at first sight. The gorgeous embroidery and flute sleeve details were what I particularly loved. So much so, I did not think twice about packing it in my suitcase for my recent impromptu getaway to Mykonos with Lucia. After rushing around like a mad woman less than 24 hours before we were meant to be flying to the Greek Island of Mykonos and a last minute panic of not having enough clothes for our trip, this dress was squeezed into my suitcase for my first holiday of the year. 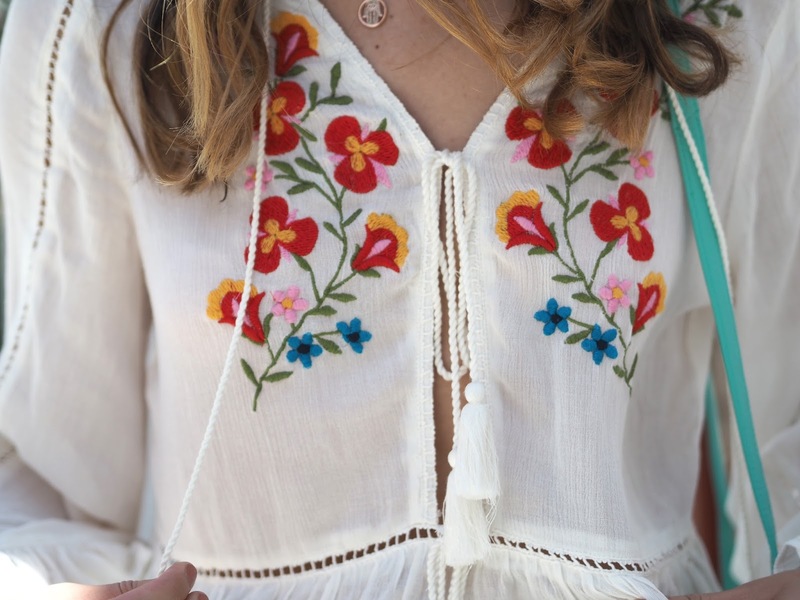 After purchasing this embroidered dress on a whim, my trip to Mykonos seemed like the perfect occasion to finally get some wear out of this beauty. I mean look how perfect it is against the pretty white streets of Mykonos town. The perfect backdrop for a perfect dress. The best part is that it doubles up as a dress as well as a beach cover up which is ideal when your attempting to travel light for your holiday. I don't know about you but my 20kg baggage allowance usually consists of shoes, shoes and more shoes and I wonder why my suitcase is always so heavy. As I wore this dress for a daytime look, I put a pair of cut off denim shorts underneath and teamed it with some lace up sandals. Despite the long sleeves, this dress is very light and airy which steers you away from feeling uncomfortable in the heat. I feel as though this look is very vibrant but what's summer if not to inject a splash of colour into your outfit?! Speaking of colour. If you've been eyeing up my bag then I have some good news for you. There's just a few days left on my Instagram giveaway to win the same Radley bag I am featuring in this post. 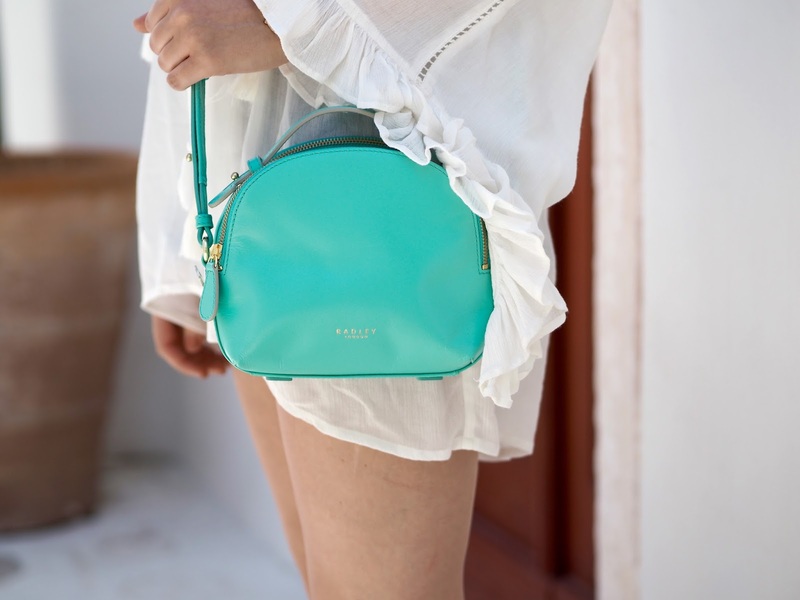 All you have to do is comment on my Instagram photo telling me how you would style this bag to get #RadleySummerReady and follow Radley London. It's really that simple! Just comment here or here for a chance to win. 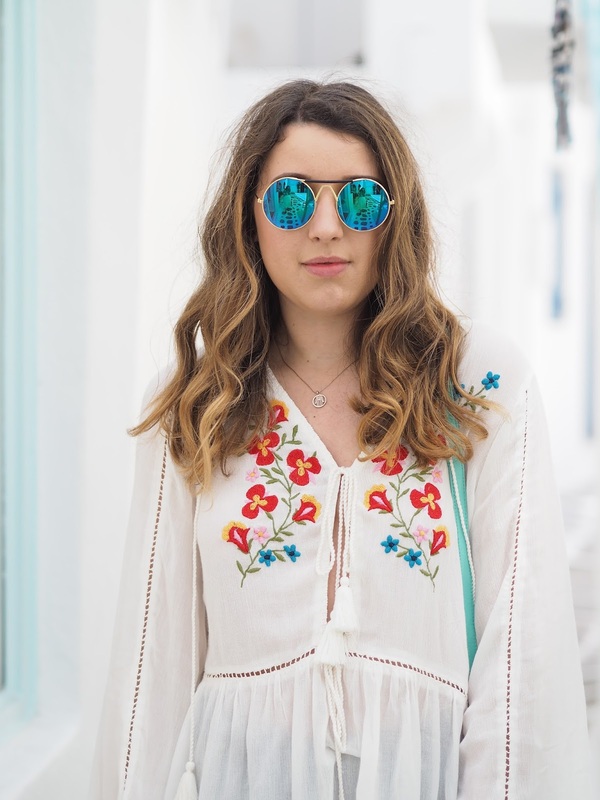 After arriving home and having well over a thousand photos to sift through (I kid you not), I cannot wait to share with you an array of outfit photos, a holiday look book and a guide to staying in Mykonos. So stay tuned for a low down of the beautiful Greek island that is Mykonos and hopefully some outfit inspiration for your holiday and summer wardrobe. In love with this outfit - perfect for summer. Definitely a good purchase, Mykonos looks so pretty and I'm ridiculously excited to be visiting soon! The colours in this post are killing me, absolutely beautiful! That Radley bag is insane, I have the navy version but my god that colour is just too much. I loved this outfit! I'm from Greece so I can tell you that's very summery and pefrect for our islands :D GOOD JOB!